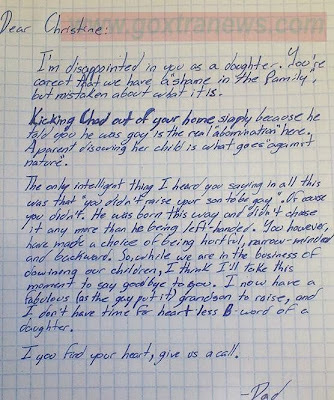 GoXtra News: A sad letter by a Grandfather of a GAY who came out of the CLOSET to his DAUGHTER! 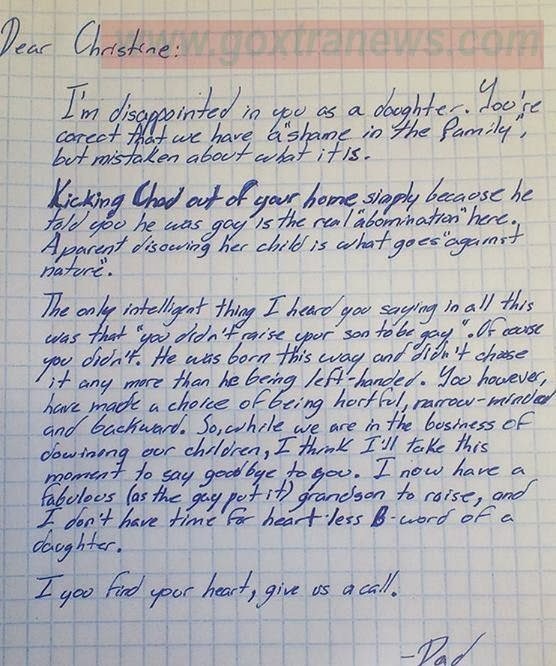 A sad letter by a Grandfather of a GAY who came out of the CLOSET to his DAUGHTER! THE a sad thing about coming out of the closet - you don't know whether your family will accept you or not! Familiar with the situation yet? As sad as this might be, it surely does happen to most gay families. "The only intelligent thing I heard you saying in all of this was that "you didn't raise your son to be gay." Of course you didn't. He was born this way and didn't choose it any more than he being left-handed. You however, have made a choice of being hurtful, narrow-minded and backward. So while we are in the business of [disowning] our children, I think I'll take this moment to say goodbye to you. I now have a fabulous (as the gay put it) grandson to raise, and I don't have time for a heartless B-word of a daughter. If you find your heart, give us a call."